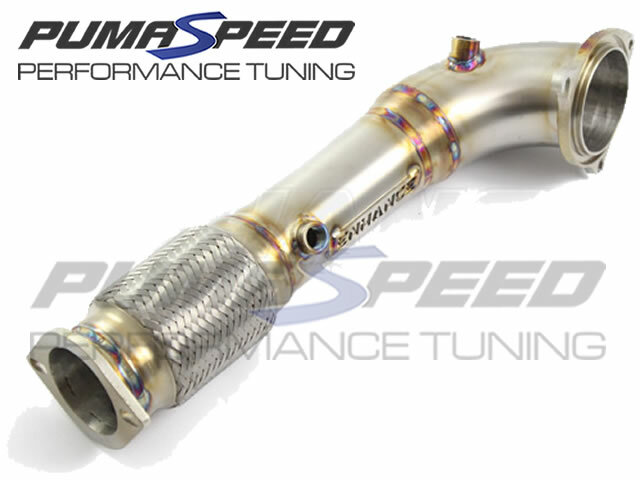 Pumaspeed are proud to supply and fit the Enhance Performance Fiesta ST180 Ultimate Large Bore Downpipe! Upgrading the restrictive OE downpipe with the EP Ultimate Large Bore Downpipe is a great way to increase performance and Enhance the exhaust note. Performance is gained through removing exhaust gasses at maximum velocity through the EP downpipe. Designed and manufactured in-house using only premium materials and world-class manufacturing techniques. Delivering unmatched quality and reliability. The factory downpipe system consists of smaller, 55mm piping with tight bends and a restrictive high-cell-count catalyst, all of which contribute to restricted performance. We took an unrivalled approach to maximising flow, reducing under bonnet temperatures, and removing restrictions. The 90mm turbine exit tapers slowly into a 76mm flex joint, the gradual taper is crucial for maximising performance! Suitable for OEM & aftermarket cat-back exhaust systems. Fitting de-cat may result in EML light, a sensor spacer may solve this. De-cat for off-road use only. The Pumaspeed Workshop team are ready to fit the Enhance Performance Fiesta ST180 3.5 Inch Decat Pipe in our Head Office located here. We estimate the labour time to be approximately 1.50 hour(s) costing £117.00 inc VAT. Therefore making parts and labour a total cost £386.95 (inc. VAT). Pumaspeed have a specialist distribution team that can dispatch the Enhance Performance Fiesta ST180 3.5 Inch Decat Pipe to any destination worldwide.